Review: 2014-03-07, the fight between Eduardo Dantas and Anthony Leone gets three stars only thanks to a good finish. Eduardo Dantas entered this fight with a professional mma record of 15-3-0 (60% finishing rate) and he is ranked as the No.4 bantamweight in the world, he is 25 years old (one less than Leone) and he suffered his last defeat in 2012 when he faced Tyson Nam at Shooto Brazil 33. His opponent, Anthony Leone, has an official record of 13-6-0 (46% submission victory rate – he has never won by ko/tko) and he entered as the No.42 in the same weight class, last year he fought twice winning against Frank Baca in July but then he lost to Rafael Silva who was originally scheduled to face Dantas but then Silva was forced to pull out of the bout due to injury (=Leone vs Silva). 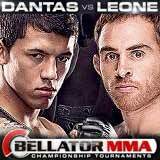 Dantas vs Leone, main event of Bellator 111, is valid for the Bellator bantamweight title (Dantas’ second defense). Watch the video and rate this fight!